The Billionty-Oneth Geek: Locked up in THE HURT LOCKER!!!!! Locked up in THE HURT LOCKER!!!!! On the other end of the spectrum from 2012, we have The Hurt Locker. This is action and suspense done great. During its limited theatrical run this past summer, there was early talks of Oscar nods for this movie. Interestingly enough, the Golden Globe nominations came out today, and Locker is nominated in the best drama picture category. A good sign so far! 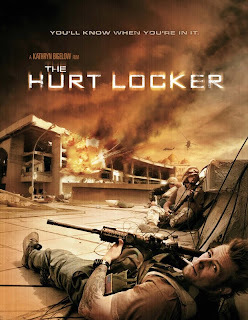 The Hurt Locker follows a bomb squad who are a part of the U.S. Army's Bravo Company deployed in Iraq. Rather than a central story, the movie opts to show a slice of life within these soldiers. We follow them over the course of the year and see how the hardships take their tolls on these men. At times, what comes across as anger to us, is actually camaraderie to them. At the head of the team is a young brash sergeant named William James, who at times seems to be living more for the thrill of it than as a duty. We see how the decisions he makes affects his two other close squad mates. The theme of decisions seems to be strong in this movie. When you're charged with disarming a suicide bomber with only 2 minutes to work with, every decision you make is crucial and absolute. We see that for Sgt. James, it's situations like this that give him a real sense of purpose and place. There's a scene near the end of the movie, where we see James in a supermarket and he has to pick up some cereal. We see him stand in the aisle staring at the endless boxes and variety of cereal. Rather than make an executive decision, he concedes. How do these mundane choices compare to the life-threatening choices he had to make? I have to give all the credit to director Kathryn Bigelow. She does a great job of knitting together scenes with a high degree of suspense. You're literally on the edge of your seat with the tension in some of the scenes. Of her repertoire of work, aside from Locker, the only one I've ever watched was Point Break and I loved that movie when I was a kid. I've seen parts of Strange Days, but never the whole thing. It's interesting because you don't find many women doing action and suspense movies, but Bigelow really nails it here. I think what also bolstered my enjoyment was all the Call of Duty I was playing the past 2 months. The scenes in the movie looked like something directly out of the game (or vice versa... whichever). It captured the feeling of being in the Middle East; from the desolate desert backdrop to the ominous shouting in the background, all worked well in making you feel like you were right there in the thick of all the tension. I can't wait to watch this movie again. This is one that would be great on Blu-Ray if you've got a player. I've shortlisted it on my list of favourites for the year, but haven't decided where it will end up yet. That's it for now, later geeks!